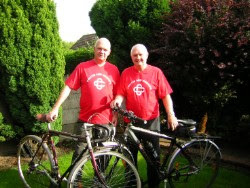 The father and son team of Allan and Neil Farimond, aim to tackle the Pyrenees on a gruelling 13-day bike trek in aid of the National Association for Colitis and Chrones Disease. This is a charity is important to them as Neil's son Matthew has Chrones disease as well as many other members of their extended family. 68 years young Allan has actually finished the trek before and is the more experienced of the team. The aim is to raise at least £1000 (about US$1900) for the National Association for Colitis and Chrones Disease. The more money they can raise, the more worthwhile the venture. A number of our family members are affected by Crohn's Disease and it is a very dehabilitating condition which can go into remission but then suddenly flare up and be very uncomfortable." Chrones Disease is also more common than you think and yet receives far less publicity than diseases like cancer or heart disease. For more information and to see how they are getting on with raising funds for Chrons Disease go to their website: www.justgiving.com/allanfarrimond.